All of our wrought iron work is custom designed and forged. Wrought Iron Works offers clients free, professional estimates and will work you every step of the way to create and design sought after to enhance the beauty of your home or business with affordable, safe, and creative products that are guaranteed to last for years and resist rusting and environmental damage. All of our products are hand made in our West Hartford, CT shop. Our experts can improve the look of your property, whether it be your front yard, backyard, or inside your home. At Wrought Iron Works, we provide year-round services for residential and commercial properties. Wrought iron gates and fencing add beautiful, timeless elegance to your home or business. The gate or fencing can be anywhere from formal and classic to causal and quaint. We can customize your project with one-of-a-kind decorative touches such as pointed or curved tops, patterned rails, or decorative elements layered over the iron gate or fence. 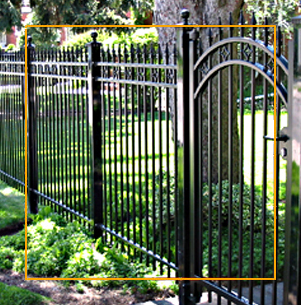 Wrought iron gates and fences provide security, are very sturdy and durable, and will last for generations to come. 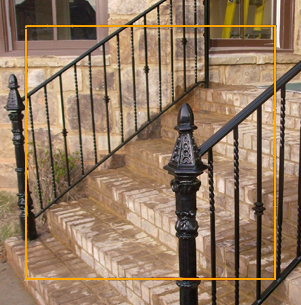 Wrought Iron railings are a beautiful and durable way to provide saftely around your deck or stairs. Railings are not only desirable, they are usually required on decks and stairs. We always build to code so you can rest assured that your railings will provide safe and secure protection to prevent falls, trips, and slips. Our railings are custom designed and made in our shop and installed by our own professionals. They can be classically simple or ornate and elaborate. Your imagination’s the limit! At Wrought Irons Works we design and forge all of our pieces in solid iron providing superior strength and durability. Hand forged wrought iron has a textured, rugged appearance with many variations and custom detail. 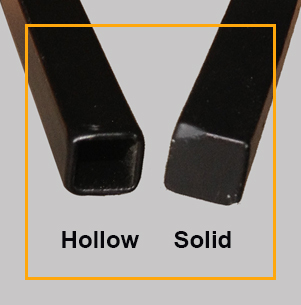 When comparing pricing, always remember that if a provider does not state that their wrought iron is solid, there’s a very good chance it’s the less expensive hollow version. Be an informed consumer and insist on the best! Wrought Iron Works has been designing and fabricating interior and exterior spiral staircases for many years. Our professional craftsmen can turn an otherwise basic area of your home or business into a beautiful and functional work of art. A spiral staircase consists of 3 main components; the tread, balusters, and handrail. Any or all of these can be made from wrought iron. 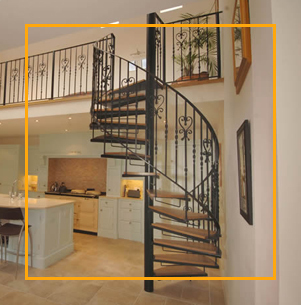 Precise measurements are key when designing a spiral staircase and we have the expertise to assure a perfect fit to look exquisite and meet all building codes and specifications. All projects by Wrought Iron Works are quoted, measured, designed, fabricated, and installed by our in-house experts. Wrought Iron Works can repair and restore your damaged or broken wrought iron so it will continue to beatify and protect your home or business for many years. Contact us and we will happy to provide an quote for your project. Wrought Iron Works has many years of experience and are experts in forging all types of wrought iron railings, staircases, gates, door and more! We have a full shop where we create all of our custom pieces right in West Hartford. We have developed a reputation of superior craftsmanship and creative design ideas. Contact us for a quote! Wrought Iron Works, LLC is made up of second generation wrought iron workers, and has been in business since 2000. We are happy to provide a “Quick Quote” based on your project description and pictures. Wrought Iron Works is a family owned business that has been in West Hartford for many years. We pride ourselves in being able to offer first rate quality and services at competitive rates. Wrought Iron Works can work with you to design the perfect piece for your project. Wrought Iron Works has worked with me on several different projects. They are working on a wrought Iron railing now and I can't wait for it to be done. Their work is beautiful and they are always reliable, within budget, and pleasant to work with. I highly recommend Wrought Iron Works. The team at Wrought Iron really knows how to treat their customers. We needed a simple step railing for outdoors. They came in with a fair price, and then provided the service as promised. When I called about making a minor adjustment (adding brackets to the bottom), the made the change quickly -- and without a fuss. I would not hesitate to recommend these guys, and plan on using them again in the future.